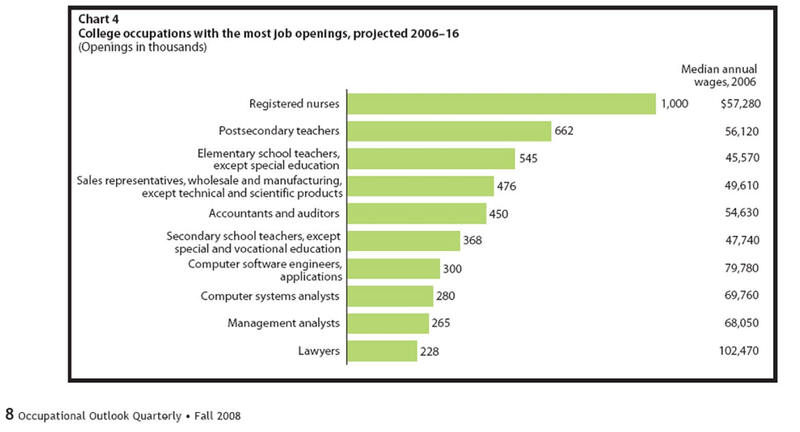 Department of Labor predicts education requirements of new jobs. Career Beginnings for Business Majors. http://www.bls.gov/opub/ooq/2009/winter/ is the latest update for winter of 09.
where more than 50% have a college degree or higher. Material is from Job Outlook Fall of 2008, Job Outlook by Education Occupation 2006-2016. Will someone please tell the politicians we have too many college graduates and many have an unemployable major! What we need is an educational system that trains for our children's real future, not some academic ideal 1000 years in the future. Ten Year Total is 4.574 million. Top Ten Chart Total is 7.562 million. have a college degree but more than a high school diploma. diploma. Top Ten Chart Total is 8.16. 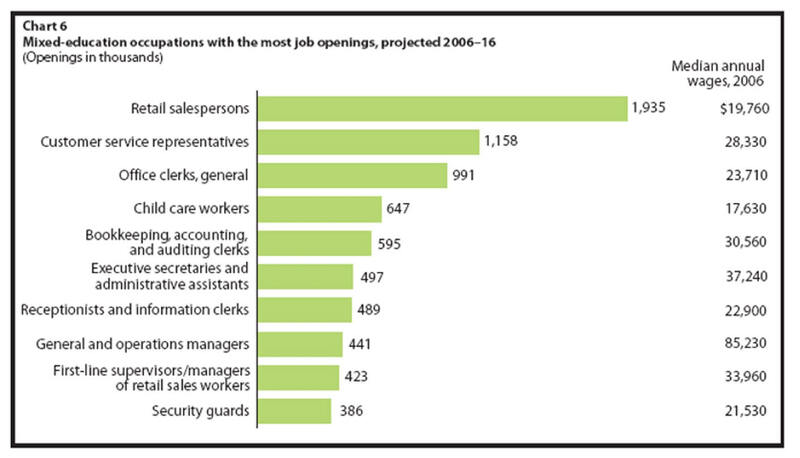 "Between 2004 and 2014, BLS projects 55 million job openings for workers who are entering an occupation for the first time. Of these, at least 13.9 million [25.3%]are expected to be filled by college-educated workers." It is important to understand their definition of college-educated workers. It is those working in one of two groups of college graduate occupations. In "... 'pure college' occupations', at least 60 percent of current workers aged 25-44 have a bachelor’s or higher degree, fewer than 20 percent have a high school diploma or less education, and fewer than 20 percent have taken college courses but do not have a bachelor’s degree." 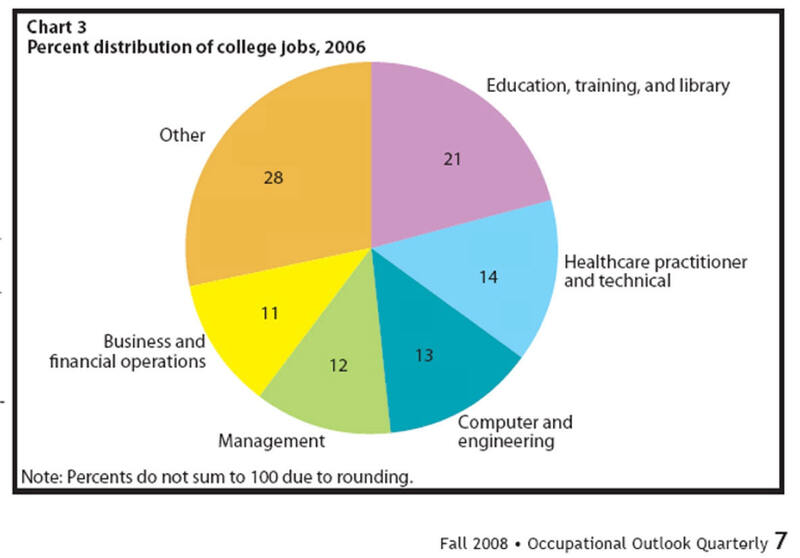 BLS projects that pure-college occupations will provide about 6.9 million..." [about 12.5% of the total openings]. The August 20&27 issue of Business Week states on page 45 that the BLS reports that 34% of adult workers in the U.S. now have a college degree. If only 12.5% of our jobs require a pure college degree and if another 12.5% require what might be described as significant college, why are so many academically average students being pushed into algebra at the expense of vocational and career training. Editor's Note: Of my eight nephews and nieces, four have a college degree and of the the two highest earners, one dropped out of school a week into the ninth grade and earned a GED and the other graduated from the carpentry department of his high school. Download the PDF (2,530K) and see page 14 of the Employment Outlook Quarterly Vol. 53, #3 the actual data. Editor's note: While only 16% of the new jobs requiring a bachelor's degree or more may seem low, read on to see why it is quite accurate. 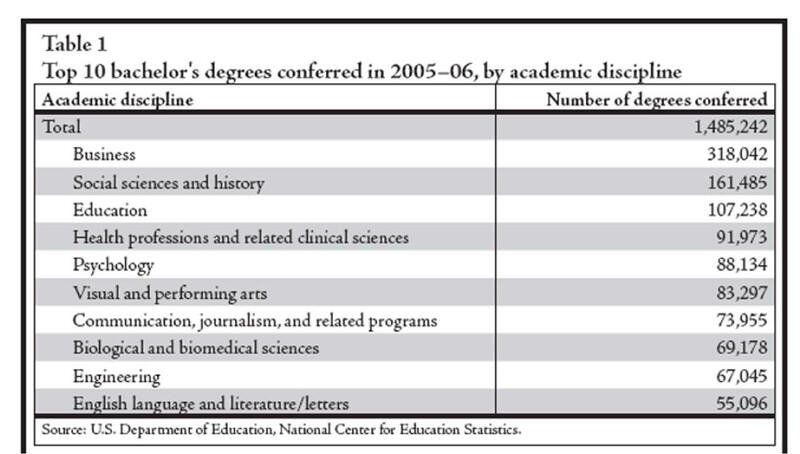 Editors Note: Read on to see how little has changed in the number of obs requiring a college degree. Editors Note concerning the following Chart. Ten years have gone by since the Bureau of Labor Statistics 1998-2008 Job Growth Projections analysis which appears below and has been updated here for 2004-2014 data. Little has changed though that projection missed the big drop in computer science jobs. Projections seldom see a big change coming. C. Table in parenthesis is relevant table number in Occupational employment projections to 2008. D. Data arrangements and comments are from 21st Century Learning Products. A. Short, Medium, and Long-term on-the-job-training is S OJT, M OJT, and L OJT respectively. Editors note: Expected college graduates not working in college graduate jobs in current decade over previous decade is expected to drop from 14% to to 7%. Real problem, a real shortage in science and math career and because the labor department is expanding jobs requiring a college degree to career such as administrative assistant (secretary), some feel the over supply is mot going down. 1Income Hourly Quartile Ranges: Q1 is "very high" at $16.25 and over, Q2 is "high" at $10.89 to $16.24, Q3 is "low" at $7.78 to $10.88, and Q4 is "very low" at up to $7.77. 2Correctional officers require long-term on-the-job training. Individual occupations growth data is available. A. 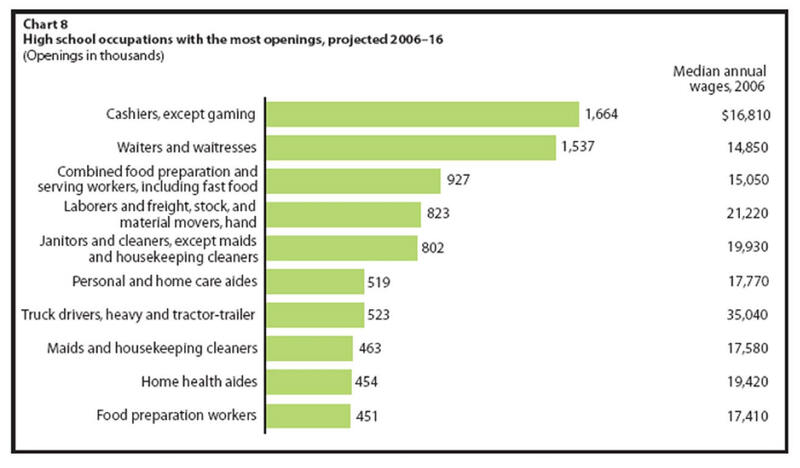 Table III of Occupational employment projections to 2008 has detailed growth for more than 500 occupations. B. Let the computer do the searching by visiting BLS Occupation Growth Search. IV. Want to learn more about individual occupations growth and expected salaries? B. It was published in the Spring 2000 edition of Occupational Outlook Quarterly of the Department of Labor.